Steed: "Following in my father's footsteps—he spent his life depositing money; I spend mine withdrawing it." The new titles are bolder, "Bond-er", more aggressive and stylish. The theme is still the same, a good thing, and the trademark silhouette shot closes them with distinction. Oh, and then there's the champers—a favorite libation, lest we forget. Mrs. Peel has new digs, and a whole new look from auburn hair (or was it always?) to a totally mod couture, courtesy of Alun Hughes. Even Steed's been updated by Pierre Cardin to be sleeker in his impeccable way. This episode also has the first of the famous "Mrs. Peel, we're needed" signs that mark every episode to the end of her run. This story is in true form—top men in some field being targeted by some subversive group for some dastardly reason. This time it is astronomers, who all suffer hot flashes and premature aging (nah, not some weird male menopause, but that would make a story!) and ultimately death whilst observing Venus through their telescopes. As they are all members of the BVS—British Venusian Society—Steed joins up to bring this intergalactic mystery back down to earth. The dialogue seems more sassy than witty for our Mrs. Peel; something I hope will not become a trend. Note to continuity editor: Brigadier Whitehead is strangely clutching an LP when Steed turns him over that he was not holding when he died. Libations: Steed pours a beer; Emma enjoys something tall and cool. I'll rate this a one 2-1/2 libations. Pemberton: "We are not playing, Mrs. Peel, the stakes are too high. Now, how much does Steed know?" Mrs. Peel: "Well I'd say he had a pretty high IQ." Sass over wit again, bloody shame. A strange phenomenon is wreaking havoc inBritain's ceramics industry, as it seems the men at the top are turning up either mad or dead. Enter the BEB, the Business Efficiency Bureau, who offer to "eliminate" the competition, efficiently, of course. Their methods are psychological, and they base their work on the subject's deepest fear. The best scene comes as the end tag, when we find Steed's greatest fear is running out of champagne.... Weak plot, terrible effects, thin dialogue—nothing to really save this one. Note to continuity editor: In the pit scene, Steed's double jumps over the bulldozer as it runs over the bad guy—took me a couple of replays to get that this was meant to be Steed! Libations: Steed and Emma share coffee, then their belovéd "champers" at the end. Left me dry. High-profile miscreants and bandits arrive in Britain and then mysteriously vanish. This one begins with an agent found floating in the Thames after discovering clues that lead to the escape route. There is an elaborate network that includes stuffed animals, a barber, nuns, and some sort of hybrid "oriental" shop, before the rich and infamous are blindfolded and driven to a house in the countryside to make their exit. This one is a romp backwards in time, with fun costumes, well-suited period music and some delightful, personal exchanges scattered between the clues and the kickboxing. Note to continuity editor: What's up with Emma standing in the path, waiting to get hit by the motorcycle? That was one nasty toss she took, and yet she is unscathed again...amazing. Libations: Steed: 2 drinks and champagne; Emma: 1 drink and champagne. Not a favorite by far: 2-1/2 glasses. Image Transfer Review: Once I got over the shock of color, I noted it was uneven and a bit coarse, especially in the first episode: skin tones when from palish to yellowy in subtle but distinct flashes. Over all this disc has the look of 60's British television in general, which may be the fault of the source material. Judging from the quality of the black and white episodes, my guess is that this is the case. The colors do smooth out in the latter 2 episodes, and the images are clean and clear, even if a bit disappointing. Audio Transfer Review: The theme has always been stunning, an icon of the era, and the music chosen for individual episodes is, in most cases, equal to the scenes they underscore. From the comedic scenes to the height of suspense, the tracks are almost always right on. Extras Review: The change in package design for the color series is a disappointment, flat and muddy-colored and nowhere near as exciting as the previous series. The menus are updated too, with some good and bad results. It's a snappier, more 3D sort of interface, but the problems are still there: too many clicks to navigate the chapters, etc. The extras consist of a gallery of stills from individual episodes included on each disc - these are now a bit bigger and so easier to enjoy, but I found the tabular interface confusing, and the number of images disappointing. 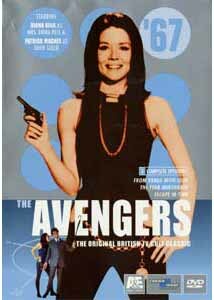 Every disc also has a menu link to A&E's "www.originalavengers.com", a good marketing move but poorly executed - why not give us a real taste of what's in store for us there?Bios, interviews, scripts—all would be welcomed by aficionados and newcomers alike. Some of the finer points of the earlier series seem to have fallen victim to the color upgrade. The titles are better, the sets more interesting, but the charm and wit seems to be replaced by a cocky arrogance that I hope fades in later episodes. Still, cheers to A&E, who have done a smash up job overall. I can only lift 3 libations for this one.